Western Canada Baseball is a history of amateur and semi-professional baseball on the prairies from the early 1900s (including the early Western Canada professional circuits of 1907 to 1921) to the late 1970s. There are hundreds of pages of game reports, rosters, photos, statistics, on baseball in Western Canada, the North-western USA and Southern Ontario's Intercounty League, especially from the late 1940s through the mid 1960s, one of the most productive and tumultuous periods in North America (check out the Timeline). 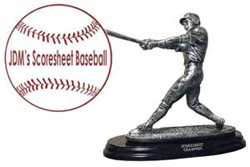 Scoresheet Baseball is a simulation fantasy game in which you draft and manage a team of major league players in leagues with your friends & colleagues. There are leagues for those who wish to start from scratch and draft new rosters for each season and "perpetual" loops in which owners choose to keep a certain number of core players season to season. Managing includes line-up decisions -- the best active 30-man roster, batting orders versus LHP & RHP, pitching rotations, whether to employ a closer, how much weight to give to defensive rankings. And, there's trading, of course, and the test of picking prospects. Weekly reports include box scores. 2017 will be out 28th year of our participation. For fans of a certain era, the Dodgers were THE team. That's the Brooklyn Dodgers. And, in 1955, decades of frustration came to an end, as 1955 turned out to be "Next Year", as Dem Bums won their first World Series downing the hated Yankees in seven games. This is a brief introduction to the Boys of Summer with links to much more. There was a time when CBC local television was quite the thing with local news, sports, drama, and special events coverage. CBLT, the flagship station of the Canadian Broadcasting Corporation, was a force in Toronto, the country's largest market, into the 1990s until continuing budget cuts crippled the operation. This site provides a glimpse at the breadth of talent at CBLT in a period from the mid 1980s to the late 1990s. Lloydminster High School Reunion The classes of 1957-58, 1958-59, 1959-60 and 1960-61 assembled in Lloydminster, SK-AB, August 1st and 2nd, 2009. For the group of 1958-59 it was such a special occasion - the 50th anniversary of their graduation. A marvelous turnout marked the occasion of what is likely to be the final reunion. Kudos to Ruth, Ruby, Donnabelle, Diane and the gang for their amazing work.